UK unemployment fell by 52,000 in the three months to August to 1.4 million, leaving the jobless rate unchanged at 4.3% from the previous quarter. However, pay still failed to keep pace with inflation, with the real value of earnings down 0.3% over the past year. Total earnings, excluding bonuses, rose by 2.1% from June to August, said the Office for National Statistics. The news will increase expectations that the Bank of England will raise interest rates on 2 November. However, Kathleen Brooks of traders City Index said the Bank faced a tricky decision next month. "The prospect of raising interest rates when real wages are in negative territory will make this potential hike a tricky one for the Bank to justify," she said. The unemployment rate is still at the joint lowest level since 1975, although the claimant count increased by 1,700 to 804,100 last month. The UK's key inflation rate rose to 3% in September. There were 32.1 million people in work in the UK in the June to August period, 94,000 more than between March and May and 317,000 more than in the same period in 2016. The employment rate was 75.1%, up from 74.5% a year earlier, while the total number of unemployed people was 215,000 fewer than at the same time last year. Employment Minister Damian Hinds said: "Our economy is helping to create full-time, permanent jobs which are giving people across the UK the chance of securing a reliable income. The female unemployment rate is at a joint record low of 4.2%, while job vacancies have gone up by 3,000 to a 783,000. The number of people classed as economically inactive, including those looking after a sick relative, on long-term sick leave, early retirement or who are not looking for a job, fell by 17,000 to 8.8 million. Commenting on those figures, senior ONS statistician Matt Hughes said: "Many labour market measures continue to strengthen. Employment growth in the latest three-month period was driven mainly by women, with a corresponding drop in inactivity. Vacancies remain robust, at a near-record level." Unemployment drops! A record low rate! Earnings shrinking against inflation! Once upon a time, these were all big headlines. But we've become so used to them now, they barely cause a ripple - and that has its own implications for interest rates. The latest numbers reinforce what the new deputy governor of the Bank of England, Dave Ramsden, said on Tuesday: there's little sign of wages picking up in response to higher inflation. Nevertheless, the City remains convinced the official rate will have to rise from its record low of 0.25%. The pattern of trading in interest-rate derivatives - investments that effectively bet on when interest rates will rise or fall - suggests there is an 82% chance that rates will go up to 0.5%. If so, it would be the first rate rise in more than 10 years. We won't have to wait long to find out who's right. Margaret Greenwood, shadow employment minister, expressed her fears at the continuing fall in the real value of wages. She said: "With a record number of working people living in poverty, the news that real wages have fallen yet again is deeply concerning. "While the overall increase in employment is welcome, it's also clear from today's figures that too many people are struggling to find employment because of their age, ethnicity, disability, or where they live." 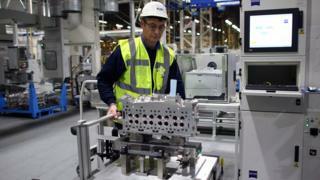 TUC general secretary Frances O'Grady commented: "Britain desperately needs a pay rise. Working people are earning less today (in real terms) than a decade ago. "The chancellor must help struggling families when he gives his Budget next month. This means ditching the artificial pay restrictions on nurses, midwives and other public sector workers. And investing in jobs that people can live on." Enter your details below. Source: Office for National Statistics. How does 3% inflation affect me?